What to do with all that leftover bacon grease? With this simple process you can turn that unwanted grease into something useful around the home - soap. This recipe is very simple and the process takes about 90 minutes from start to finish. The first step is to get the grease separated from any bits of burned bacon or other "stuff". The easiest way to do this is to pour it into a cup of warm water and mix it up. Let the mix sit at room temperature for a couple of hours and then put it in the refrigerator overnight. The grease will all float to the top and the bits will sink to the bottom. This also solidifies the grease a bit to make it easy to scoop off the top. I saved up the grease from a few batches over about 2 months and was able to get about 22 ounces. The lard keeps in the fridge for quite some time to you can save it up for as long as you need to. Once you have enough it is time to weigh it out and determine how many ounces you have. This will be the base for the recipe and all other ingredients will be based from this amount. Once you have the ounces head over to www.soapcalc.net and click on "soap calc lye calculator". This will take you to an 8 step process to determine your recipe. 1: Select NAOH - This is the type of Lye I used and is commonly bought as pure lye drain cleaner. You can also use KOH which is derived naturally from wood ashes. 5. Select "lard, pig tallow" from the list of oils. Here you can see you can make soap from all kind of different oils. 6. Click "add" and then type 100% in the box. You can mix other oils in with this calculator as well if you so wish. 7. Calculate and then display/print your recipe. You now have all of the info you need to get started. Get out two stainless or glass pots and set on separate burners, put both on low or one notch up from low heat. Next weigh out the water according to the recipe and add it to one of the pots. Add your lard to the other pot. Weigh out your lye according to the recipe and slowly stir it into the warm water until it is dissolved. Once the lard is liquefied go ahead and add the lye mix to the lard and slowly stir it in. This is where the fun begins (ok, not really) you need to stir this mix for about an hour. I stirred it for about 5 minutes and then went away and came back after about 10 minutes to stir again. Keep doing this until the lard thickens. Once you are getting a trace behind the spoon when you stir you know it is ready. Now you can pour the soap into some kind of mold. I used a plywood rectangle mold that I threw together in a few minutes. You can purchase nicer ones below. Once in the mold you need to let it sit for 24-48 hours and then you can cut it out and slice it into bars of any size. It is best at this point to let the soap sit for a week or two to fully harden and let the saponification process complete fully. At that is it, you have just made soap from back grease or lard. We have been using it for about a month now and we all love it. 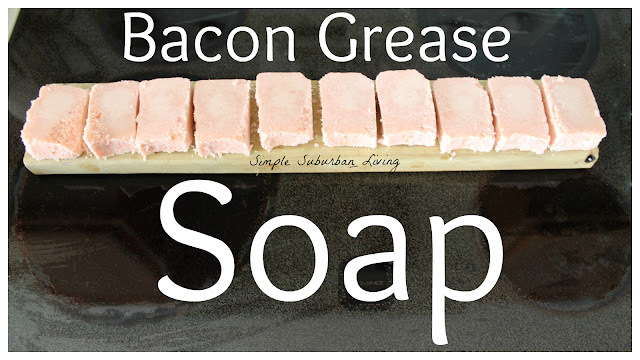 It is not the best soap you can make but for next to nothing you can make basic soap from grease that you would probably throw away anyway. You can also be creative with the soap calc and add in other types of oils to get different results, have fun with it and see what you can come up with. Please share any recipes that works well for you on our Facebook page or here on the blog or YouTube comments. Nothing is said about the ratio or qty of lye to use?? ?